The Education Campus is involved in the School Self Evaluation 2016-2020 Cycle. School self-evaluation is a collaborative, inclusive, and reflective process of internal school review. An evidence-based approach, it involves gathering information from a range of sources, and then making judgements. All of this is done with a view to bring about improvements in students’ learning. Below is the Six-Step Process for School Self-Evaluation. As part of this process the Campus completed a few stages in the cycle by gathering evidence during surveys undertaken last year of students, parents and teachers. The campus analysed all of the surveys and identified differentiation and active learning methodologies as key areas of focus to bring about school improvement. The school improvement plan is published each year. As part of the SSE process Literacy, Numeracy and Teaching and Learning are specific areas of focus. Maynooth Education Campus will be participating in the PDST Forbairt programme from September 2017 – September 2018. 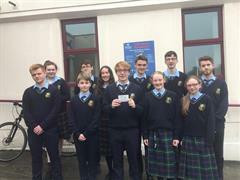 Each participating school involved in the Forbairt programme is tasked with taking part in Action Learning process that enables professionals to learn and develop through engaging and reflecting on their experience in the company of peers as they seek to address real-life problems in their school. As such Maynooth Education Campus will focus on Bloom's Taxonomy and sharing of active learning methodologies. These two areas were identified as key aspects of school improvement based on the School Self Evaluations surveys of students, parents and teachers undertaken in the school year 2016-2017. Our school promotes literacy throughout the entire school year across all subjects. It is not specific to English alone as new language skills are needed in every subject taken. All teachers encourage students to expand their subject specific vocabulary by reinforcing key words students will come across. The literacy programme in the school culminates in Literacy Week, usually held in April. Several initiatives are run throughout that week, including a Book Fair, Book Swap, 6 word stories, word of the Day, Book Shelfies, Countdown Competition, Banned Book displays and many more. Students are encouraged to take part in poster competitions promoting literacy throughout the school. Reading classes are regularly held in Junior Cycle all year long in conjunction with independent reading projects. Last year the week-long activities, targeting Junior students in the Campus were a book swap, a book fair ran in conjunction with Maynooth Bookshop, story competition, literacy games and a talk to 1st year students from renowned storyteller Niall De Búrca and a talk to 5th years from former English teacher and newly published author, Mr. Gerry Herbert. Library and author visits and theatre trips are organised at different stages of the year and all years are included in a variety of these. Summer reading schemes are held for both students and teachers and all are encouraged to participate. Prime and composite numbers activity with 2nd year classes. In addition to Numeracy week, we promote numeracy in all subjects by asking students to calculate their percentage in class assessments. As part of the School Improvement Plan which was circulated when we returned to school at the end of August the Numeracy Sub-committee require the help of staff members from all departments to help with the process of putting the improvement plan into action for the Numeracy section. The stages which have been completed by the Numeracy Sub-committee to date are outlined below. Schools should consider the evaluation approaches that they will use. The types of evidence required will depend on the focus of the evaluation and the domains and standards that the school has used to focus the evaluation. Any staff member who would be willing to get involved in the Numeracy initiative please contact a member of the S.M.T. or Mr Lloyd. TL21 - Teaching and Learning in the Twenty First century is a research programme led by Maynooth University. Our school has been taking part in TL21 for the last number of years. As part of the programme, every school chooses a specific area for research and development. The focus for this school was the use of Learning Intentions in class. Learning Intentions should be shared with the class so the students are made aware of what is expected of them going into the class and what they need to know by the time they leave. The first step of the research was to survey all staff and students about the use of sharing learning intentions with the class and the result was that they were not being shared. Starting with a pilot group of staff and their classes, the learning intentions were shared with the class and the progress was monitored for several weeks. These classes were surveyed at a later point and they found that it helped them greatly with their comprehension in class. The pilot group stage ended and the programme was opened to all staff and students in school. At the end of the two years another survey was carried out of staff and students as part of the Whole School Evaluation process. The results from this survey indicate that there was a lot of progress made but there was still room for improvement. While the current research phase of TL21 has ended, the school is committed to continuing with sharing learning intentions in all classes and recapping these at the end, thus confirming if they were achieved or not. This helps to shape the lesson in a clear manner and allows students to clearly measure their progress. In addition to this initiative the school has a Teaching and Learning committee which actively looks at T&L methodologies which can be used for all subject areas. The following two T&L resources booklets have helpful resources for group work and active learning methodologies. The first booklet was provided by the KWETB during the T&L week in 2015 and the second is a book of graphic organisers with samples. Encourage teachers to consciously modify their instructional actions so as to maximise student learning. Facilitate the conscious and deliberate utilisation of teacher actions – skills, tactics & strategies. Foster an awareness of how a teacher’s actions can impact on student learning – motivation, novelty, authenticity, accountability & safety. Re/Acquaint teachers with the extent to which learning is affected by; diverse learning styles, multiple intelligences, ‘at risk environment’ etc. Enhance classroom management and encourage / support review –individual / subject department / school. A number of teachers have completed the Instructional Leadership programme and the initiative will continue with three staff members undertaking the programme this year.